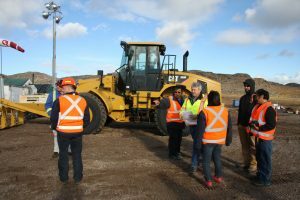 Iqaluit, Nunavut – November 14, 2017 – The Qikiqtani Inuit Association (QIA) in partnership with Baffinland Iron Mines Corp., the Government of Canada, the Government of Nunavut and Kakivak is launching a new Inuit employment and training project. The Qikiqtani Skills and Training for Employment Partnership (Q-STEP), is designed to meet the employment needs of Inuit. This program will boost skills development across Qikiqtani, with a focus on training in the mining sector, for a four year period ending on March 2021. The Government of Canada, through the Skills and Partnership Fund, will provide $7.9 million towards training 360 unemployed Inuit through Q-STEP. Baffinland will provide $9.4 million in-kind support to the project and Kakivak will provide up to $1.6 million in-kind support to the project. The Government of Nunavut will offer operations support to Q-STEP. QIA has designed an Inuit Labour Pool database, Tuttarvik, which will act as a central resource to assist employers in identifying Inuit qualified for employment or training opportunities. “Baffinland is one of the largest private employers in Nunavut and is committed to the continued employment and training of Inuit in the Qikiqtani region. The Q-STEP project will help Baffinland and our partners develop new employment and skills development opportunities, exclusively for Inuit at our Mary River Mine. These opportunities include apprenticeship and multi-skilled equipment operator programs,” says Brian Penney, President and CEO of Baffinland Iron Mines. Baffinland expects to hire 25 Inuit right out of the Q-STEP Work Readiness training. They will also give hiring preference to Q-STEP participants. Develop and deliver training programs for unemployed Inuit, with a focus on women and youth. Provide Inuit with certified and transferrable skills and qualifications to enable them to take advantage of other employment opportunities. Create an Inuit Labour Pool Database (Tuttarvik) that can help employers to identify qualified Inuit candidates.